Moore SC is home to about 14,200 people. It is part of Spartanburg county and is located 20 minutes from the city of Spartanburg and 30 minutes from Greenville. It is also 30 minutes from Croft State Park, Lake Bowen, and Lake Blalock. There are a few historical sites in the area, but none of them are classified as historical landmarks. Niven’s Apple Farm is one of the more popular places in the area. It is a fun fact to know that Moore was home to the recording studio of the Marshall Tucker Band. Moore SC may not offer a lot in the way of events or activities, but the cities and towns surrounding it take care of that. Moore is the perfect place to live to commute to work or school, and there are plenty of homes for sale to fit exactly what you’re looking for. Moore belongs to Spartanburg county school district 5 and district 6. Both districts are highly ranked against other districts in the state in several categories such as college readiness, most diverse, best teachers, safest district, and best administration. Moore is within a 30-mile radius of numerous nationally recognized and accredited colleges and universities. Moore is a great place to live to be near work, school, events, and activities that fit everyone. Moore offers great homes for sale as well, to fit whatever you’re looking for in a home. 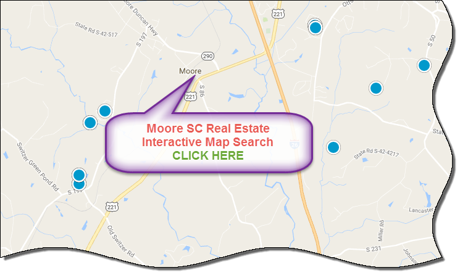 If you're looking to buy or sell a home in the Moore area, contact the PRODUCER Realty expert real estate team at 864-438-5050.